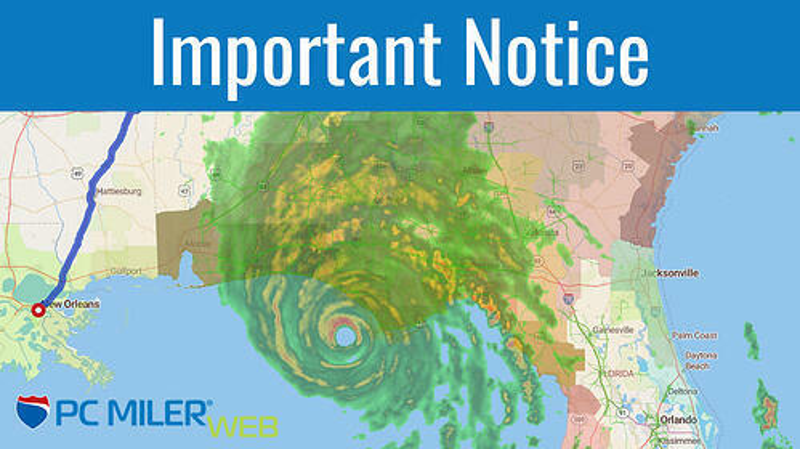 With the Gulf Coast and Southern States of the US impacted by Hurricane Michael, we’re offering you complimentary access to the Premium level of our PC*MILER Web application for you to plan around the traffic and weather impact. 1. Turn on weather and traffic display. 2. Reroute impacted plans by dragging and dropping the route to another preferred path. 3. For precise ETAs that incorporate traffic speeds, go to Route Options > Arrival & Departure and select to Depart Now, Depart At, or Arrive By. PC*MILER will calculate your ETA based on real-time conditions or the day of week and time of day.